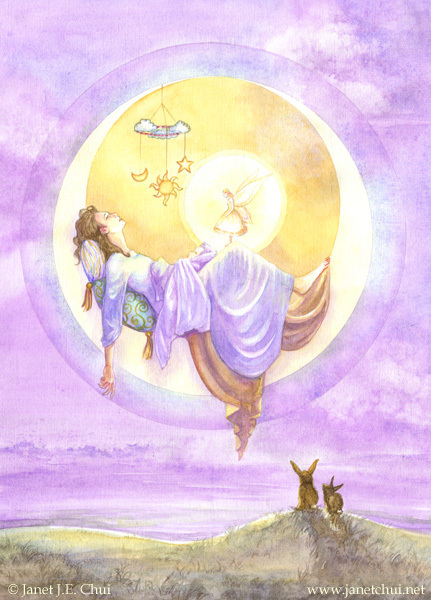 Silence and Blessed Sleep, watercolours, 2014. Only 8 days into October and the semi-expected twists and turns are still surprising. My sleep remains unpredictable, with altered states of consciousness happening earlier in the night–for me, states where I know my body is sleeping but I’m conscious of myself and my real-life surroundings, and conscious that I am not dreaming. I am occasionally aware of other beings around (that would not be visible were I awake); if friendly, I have conversations with them; if not (and this was new this week), it seems I can manage to take evasive/defensive procedures without losing sleep and waking up. The first time an unfriendly encounter happened while I was in this altered state in mid-September, I woke myself up and questioned if it was all an overactive imagination. I went back to sleep and had a dream immediately where I was placing a tall crown on my own head. It had “10 levels” to it–a symbolic message if there ever was one–that I had tapped into/achieved a new awareness. The crown was also related to a wedding (hinting at a union) and I was right beside a glass oven with the crown, looking at the items inside that were baking (ie. in the works). One of the items in the oven was a large, shallow box made of bread/clay. Heat was warping the flat lid, but the container itself held its shape. Very potent symbols all around. In my dreaming, lucid, and altered-conscious moments in sleep lately, there have been “tests”. Something tries to get me to act mindlessly–with anger or fear–and more and more quickly, I’ll feel that those calls or energies are not mine. Lately, instead of focusing on resisting (pushing what’s outside away), I’ve shifted to pulling my inside out: I’ve found the heart is even more powerful in dream/lucid/altered states than is visible in real life–in dreams it can be turned into a blinding light bulb, an engine, whatever one wishes; a refuge, a connection to Source, and from that source point, anything you need for dealing with that moment instantly manifests. (This is also a good time to bring up that the image in my blog header is called The Heart of Creation.) Two recent dreams had me dealing with “negative” situations, and I moved out of them by focusing on my heart–in one of the dreams, it allowed me to walk out of a “danger zone” while singing joyfully, ultimately giving me lucidity that lasted through two long dreams. I posted plenty of October outlooks in my last post, and they’ve prepped me well for the fiery outbursts I’m watching around me. Closest to home are the run-ins with my daughter, soon going on 5 years old–she is testing the boundaries more, she is losing her temper more quickly…though to be frank, so am I. (I’m just barely holding my own lid down!) Her outbursts seem to come a few times a day now. If any parents are reading this, all I’ll say is I hope you can take heart, as I have, that these flaring kiddy tempers and testing of limits have been forecast by at least one of the fantastic outlooks I previously linked to! I really hope these aren’t here to stay! The eclipse will be happening over here just after 6:30pm. It’ll be a good time for release ritual or meditation.